At Covina Family Dental, we are happy to offer patients dentures to replace some teeth or all of their teeth as needed. Tooth loss due to periodontal (gum) disease, tooth decay, or injury can be embarrassing. Not to mention, tooth loss makes it hard to eat and may contribute to an unflattering appearance. Patients can change all that and rejuvenate their smile with full or partial dentures here in West Covina. Contact our practice today! Dentures are removable sets of synthetic teeth that replace patients’ missing teeth. When patients are missing all of their teeth, they need a full or complete set of dentures. When patients are only missing some of their teeth, Dr. Tran might recommend partial dentures. Full dentures: Full dentures are comprised of artificial teeth that are attached to a metal framework which is covered by a plastic, flesh-colored base. The base is designed to sit on top of the gums. The base of the upper full denture covers the roof of the patient’s mouth. The base of the lower full denture is shaped like a horseshoe so there is room for the tongue. Partial dentures: Partial dentures are usually recommended for denture patients who have some remaining teeth. Partial dentures are also made of synthetic teeth that are attached to a plastic, flesh-colored base. With partial dentures, the base that covers the metal framework clasps to the patient’s remaining natural teeth. Partial dentures help keep remaining teeth from shifting and fill any voids caused by missing teeth. Partial dentures are removable and look natural. Making impressions of the upper — and, if needed, lower — jaw allows Dr. Tran to ensure that the patient’s bite will be properly aligned once the dentures are in place. If necessary, we may recommend extracting some or all of the remaining teeth to facilitate a proper bite. If this happens, the patient will need a few weeks to heal following teeth removal. Our dental experts at Covina Family Dental make temporary or “immediate” dentures onsite for the patient to wear while healing. The immediate dentures make it easier for the patient to eat and speak during this time. Once the impressions have been taken, they are sent to the offsite laboratory, where the patient’s synthetic teeth are made and set in a wax base. This is the patient’s “try-in” denture. At the next office visit, the patient tries on the wax base so the dentist can check the size, fit, and cosmetic effect of the denture(s) before the lab produces the final version. Dr. Tran makes any final adjustments needed before sending the wax base (and any additional instructions) back to the lab, where they make the final dentures. If significant modifications were needed, this last try-on step may be repeated before final dentures are made. The dentist and patient then finalize the specifications and send them to the lab. To create the final denture(s), the lab technician removes the artificial teeth from the wax base and attaches them to a metal framework covered with flesh-colored acrylic to match the gums. The last visit will be for the patient to receive the readied dentures and to explain to the patient how to use them, as well as provide instructions for care. He or she may also schedule a follow-up visit to check the fit of the dentures down the line. Patients will have to adjust to wearing full or partial dentures. The adjustment period may take several weeks or months. Patients may need to practice eating and speaking while wearing dentures. Also, it is common for patients to feel as though the dentures are loose or bulky. This feeling will go away with time as the mouth muscles adapt to keeping the dentures in place. 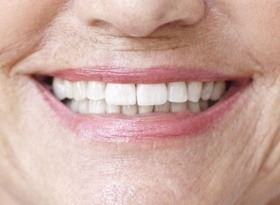 Dentures feel slightly different than natural teeth, but they are functional, comfortable, and look like natural teeth. Suitable candidates for dentures include individuals who are missing one, some, or all of their teeth and who are in good overall health. Specifically, suitable candidates have good oral health, including healthy gums that are free of periodontal disease. They must also have sufficient jawbone mass to provide a proper foundation for dentures. As individuals age, their mouths change. These natural changes may cause dentures to shift or loosen, making it hard to chew or causing gum irritation. Because of this, denture patients should have regular check-ups at least once a year so Dr. Tran can realign, remake, or rebase their dentures as needed. Stand over a basin of water or folded cloth while handling dentures, as dentures are fragile and may get damaged if dropped. Place dentures in cool water or a denture cleaning solution to avoid letting them dry out. Never use hot water to soak or clean dentures, as hot water may cause dentures to warp. Brush dentures daily to remove any stains, food, or plaque. Brush the tongue, roof of the mouth, and gums each morning with a soft-bristled toothbrush prior to inserting dentures to encourage good circulation and remove plaque. Visit Covina Family Dental if dentures chip, fracture, loosen, or break in any way to avoid inflicting further damage on broken dentures. To schedule a one-on-one consultation or to learn more about dentures in Glendora, Covina, or West Covina, please contact Covina Family Dental today.